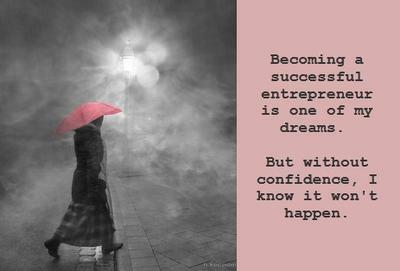 Becoming a successful entrepreneur is one of my dreams. Confidence is needed to make it happen. I am Brenda, a 44 year old single mother in California. I would love to join the league of single mom entrepreneurs, but I'm stuck. I had a career in Colorado, however, that ended with my marriage five years ago. Starting over with a thirteen year old daughter has not been easy. I worked as a temp in a dairy plant but left after two years when I realized they would never hire me as a permanent employee because they do not hire temps, ever. My thoughts began drifting toward being my own boss after I quit the dairy. The business that swims in my head is a service for single, working parents. The business would run errands, like post office runs or waiting for a repair person so the parent does not lose hours at work. The biggest obstacle is my self-esteem. If I knew one wish would come true, I would wish back the confidence in myself I had ten years ago. Everyone knew I could do anything I set my mind to back then. I would love to attend a seminar on entrepreneur mindset along with how to boost my confidence because right now starting my own business seems outrageous. I mean, what if I fail? Entrepreneurs are supposed to be risk takers....right? I need to know enough people who will let me work for them to build a reputation. I do not want to work for someone else right now because I like to be in charge and being told when I can take a break pisses me off. So if nothing is done to fulfill this dream, I will be working at a job I hate still planning to start a business someday. I would like to see seminars on decision making for the single parent entrepreneur. A series on how to make the right decisions based on the resources available in that persons community. Where I live, there are no programs that I can afford to take for building self-esteem. I Would Also Like To See A Seminar On Communicating Ideas More Effectively. I have a problem with getting people to understand my ideas. The pursuit of becoming a successful entrepreneur would mean that I learn how to communicate my ideas in such a way that people can 'get'. A Seminar On How To Motivate People To Listen Is Also Something I Would Like To Be Taught. If a person is not interested in, or does not understand the subject, they do not listen effectively. Hmmm...Should A Good Fairy Come And Grant My Most Fanciful Wishes, I Would Be Successful In Running The Business I Dream Of. There would be people working for me who were happy and well paid for the jobs they performed. Financially, I would not be living check to check worrying how I will pay the electric bill. There would be franchises across the nation. Single parents would not have to worry about leaving work to take their kids to the dentist or take them forgotten homework. Groceries would be put away in the refrigerator so moms can drive straight home from work and relax. No more sitting in hot traffic damning the lights and the grocery store because the kids need milk. Join in and write your own page! It's easy to do. How? Simply click here to return to BizPassion Course Comments.